"I have in my heart of hearts a favourite child. And his name is DAVID COPPERFIELD"
I have also a favorite author and his name is Charles Dickens. This novel is poetry. To truly appreciate the beauty of the English language, one must read David Copperfield. This book cannot be classified. It is a love story, a drama, and a comedy. It has elements of horror and suspense. I laughed hysterically, sobbed uncontrollably, and threw it to a wall in a fit of anger. It annoyed, bored, and entrapped me. The characters in this novel are like real people to me and I feel for them as I feel for living creatures. I despise Mr. Murdstone, I adore David, I want to slap his mother, I would spit on Dora, I laugh with Peggotty, I cheer Emily on, I pity Uriah Heep, and I sympathize with his aunt Betsy Trotwood. It was such a memorable experience that more than 15 years later, I can still recall certain scenes as if they were part of my actual memory. All that is good about this world (innocence, justice, truth) can be found within these pages. I cannot reccommend it highly enough. But I have one helpful suggestion: Do not read it without notebook and paper in hand to keep track of characters. They are often introduced nonchalantly only to reappear later as central to the storyline. Sign into Goodreads to see if any of your friends have read David Copperfield. Here's an alternative to the notebook: keep the Cliffsnotes handy. They usually have a character reference guide. They're also nice to give you an idea of what you just read on some of the harder-to-follow parts—although thinking back on it, I don't remember there being a lot of those, but I'm sure there were some, as Dickens' does seem to require us to have a long attention span at times. I think A Tale of Two Cities was harder to follow, personally (that one I'd definitely recommend having notes for as or after you read). I love your review, and I hope this is how I feel about it once I'm finished reading it. I loathed A Tale of Two Cities, so I'm hoping to find some redemption. Carlie, I can't take it, I just cant take it. I've tried but it's no good. For some reason I feel like a failure if I dont read it through, but i have Larry McMurtry staring me in the face and i cant go on. Put a fork in it, i'm done. John, I felt the same way. I hated Copperfield. John wrote: "Carlie, I can't take it, I just cant take it. I've tried but it's no good. For some reason I feel like a failure if I dont read it through, but i have Larry McMurtry staring me in the face and i..."
Awww, that's too bad. But don't feel like a failure. It's not for everybody. I love how you say that though. You're making me laugh. I had the exact same feeling reading Farenheidt451 but loved the movie. I've come to realize Dickens is definitely NOT for everyone. Mrs. Crane wrote: "John, I felt the same way. I hated Copperfield." It really pains me to hear that. I hope you mean you hated the book and not necessarily the character. Guess you won't be taking any more advice from me huh? It's all good Carlie. If not for you I might have always wondered and never taken a look. Having checked our books in common I see we do entertain some of the same, so your advise is worth consideration. Perhaps I might persuade you to give Faulkner a try. Come give me a look. Yours John. 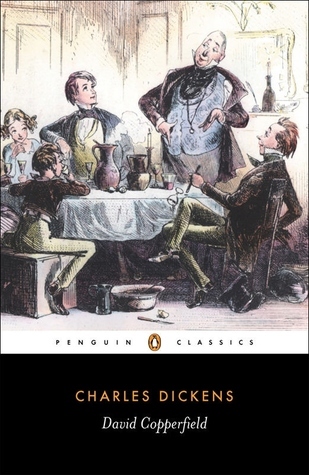 I find that I wasn't much of a Charles Dickens fan when I first started reading from him, but that with each book, I enjoy his writing more. I'm still not an enormous fan, yet, but I actually do really like his stuff. I might recommend taking a break and trying again later (maybe even a long time later, even years, if needed)—or read something else he's written first. Also, I might recommend reading from authors who talk about his writings in their writings (such as E. Nesbit)—that may increase the desire to learn more, and may perk your interest in certain parts of the book. Please don't spit on Dora. Bill wrote: "Please don't spit on Dora." She's lucky she's not a real person or I honestly would. I'm sorry if you like her. She annoyed me immensely. Hmm. I'm surprised you have strong feelings about her. She just seemed like a background character that you don't learn much about to me. Dora was a lovely person. It is possible for two good people to get married and it be somewhat of a mismatch. This is what happened. I don't think she was a background character at all. I think she taught David Copperfield several of the most important lessons of his life. One being the dangers of an 'impulsive heart'. The other being that practical competence and even the desire for it is not nearly as difficult, noble, inspiring, or valuable as being able to die well. Dora died like a champion. And he loved and saw her as she really was at that time. This is why he took it so hard. I didn't mean to say Dora wasn't an important character—nor even that she didn't do stuff. I liked you review! I think Margaret Mitchell read this book. this review is so real ! "To truly appreciate the beauty of the English language, one must read David Copperfield." Interesting what you said, I wonder what made you think so, though, because I'm really close to begin reading this as I've just finished Sherlock Holmes. Thanks!